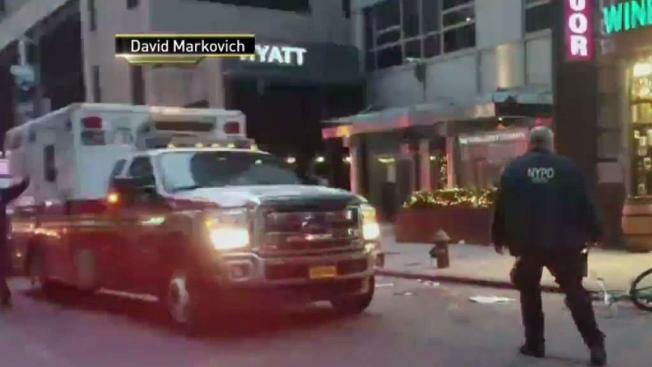 Three men were shot just blocks from the Empire State Building, sending bystanders ducking for cover on a spring-like Sunday, police and witnesses said. Wale Aliyu reports. Three men were shot just blocks from the Empire State Building, sending bystanders ducking for cover on a spring-like Sunday, police and witnesses said. A gunman was on the loose after the shooting near the busy intersection of 31st Street and Broadway in midtown about 4:30 p.m., according to police. "I was passing by and I heard four shots," one man said. "I was hiding like everybody; everybody was running around." The shooting was sparked by an argument outside a liquor store, witnesses said. The gunman opened fire, hitting the man he was arguing with and two other men who police believe were bystanders. One of those bystanders is possibly a tourist. Video captured by a witness shows a man on the ground holding his stomach. It's unclear if he was a victim. Dozens of police were investigating outside of a liquor store on 31st Street. Neighborhood resident David Markovich says he arrived at the scene just seconds after gunfire erupted. Markovich says he saw the three bloodied victims lying on the ground. He says two of the men were in front of a liquor store and the third was a short distance away and that ambulances arrived moments later. Crime scene tape was strung up around the liquor store as dozens of officers and detectives combed the area. Police said they were searching for the gunman and another man he was with at the time of the shooting. Two of the men were shot in their torsos and a third man was shot in his arm. They were all taken to Bellevue Hospital and were in stable condition, police said.